Colin Mallet, a past owner in 1997 and asking if I knew if it still existed. have any photo's of it that he could email me. "I have a photo somewhere and will let you know when I find it. I think it was a Sportiva which I bought from the “Exchange and Mart” specials page around Feb.1969. I towed it home and because it was registered in 1967 (E) did not need an MOT! It had an E93A engine, gearbox and transmission with a torque tube. It was a tubular chassis and at the back there were coil spring suspension units with integral telescopic shock absorbers. Rear axle had a Panhard rod, Hydraulic brakes. Front axle was a single spring with wishbones formed by shock absorber pivots at the top. It always overheated – which I never cured. I think the radiator was probably blocked. I sold it in early 1970 before it needed an MOT. It went to a guy near Birmingham". late September that I got back to Colin to remind him. 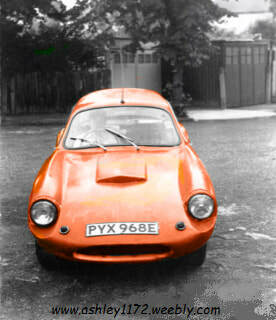 which he had painted Orange and the interior was Black, it also turned out to be an Ashley 1172 not a Sportiva. Colin also mentioned that the car had an Ashley chassis which he described to me and it was the Ashley MkVI with F/Glass floor and moulded rear seats and he confirmed that this was the correct specification for his chassis. "As I was only 20 and very little no-claims bonus, my insurance agent allowed me to insure it at the same price as a Ford 100E provided it had a single carb. So I put on a Derrington inverted vee inlet and free-flow exhaust manifold. Also I could not drive my car fast as it would overheat. It had an external water pump but nothing worked very well with the E93A engine and running gear". "There was quite a tidy one at the Beaulieu Automart for sale by a continental person, I was not able to track the owner down. It was a different bonnet front so was probably later to fix the horrible overheating mine had.